It’s no big secret that I absitively posolutely LOVE kids. LOVE LOVE LOOOOVE. So when I saw the previews for the new MBC Sunday Night variety show Daddy, Where Are We Going?, I pretty much keeled over. Add in the daddies: actors Sung Dong-il and Lee Jong-hyuk, singer Yoon Min-soo, athlete Song Jong-kook, and announcer Kim Sung-joo? Sold. Daddy can be seen as a mix of 1 Night 2 Days and Boong-eoh Bbang: the 5 father-child pairs go on mini vacations together to the boonies of Korea – without the mommies. Ensue fun times!! Seriously, it’s hilarious how little some of these fathers know how to just plain ol’ do things. And don’t even get me started on the lack of filter and artifice from these adorable kiddies. They have only gone on two trips so far, but the basic format seems to have been established. When they first arrive at the town, the families visit the 5 choices for their sleeping quarters. These homes are all quite old and distinctly un-modern (though there is usually one relatively nicer home), and the families are randomly assigned to one (by drawing out of a hat). After spending some time settling in and relaxing, the families meet at the village meeting hall, where kids are given hand-drawn maps of the village. They follow the maps to visit different people’s homes and obtain ingredients for dinner, and the dads cook dinner (at the hall) with whatever the kids bring back. There is usually an activity afterwards, and then the families turn in for the night. The next morning, the producers provide a variety of breakfast ingredients at the meeting hall, and dads can take whatever – and as much as – they would like back to their children. The caveat: It’s first come first serve. After breakfast, the families usually engage in another activity before heading back home. Pretty simple, right? Now what makes this simple show so fun and my new weekend fav? Korean variety shows are just so different from American talk shows or game shows, and part of it has to do with the cultural differences. Another part of it, of course, is just the format of these shows. What makes a lot of Korean variety shows so much fun is seeing the celebrities in their ‘natural’ state. Even reality shows, however, are scripted to a certain extent. Though I do enjoy We Got Married, for example, and like to imagine there’s at least some kind of emotion shared by the couples, I’m not stupid enough to believe everything’s natural or even purely from the celebrities’ heads. It’s scripted for suresies. And the same goes for talk shows. Yes, the guests are talking about their lives and true events, but there is a basic outline/script they follow – if for nothing else, then for the sake of content and flow. The very lack of this predetermined script is what I love most about Daddy. These are just ordinary kids, not child actors, and they do and say whatever they please. It’s what’s so refreshing about children at this age – they’re very observant, and they’re not afraid to say what’s on their minds. The fact that they’re with their dads, not complete strangers, helps them behave more naturally. Now who exactly are these kiddies and their daddies, you ask? Let’s start with the oldest of the bunch and one of my favorite actors: Sung Dong-il (45 yo). I’ve always loved this man, but he really solidified his status in my Favorites Page with his turn as Daddy Sung in Answer Me 1997. The man has the ad lib down to an art, and I honestly can’t think of many – or any – who can top him in that department. Turns out our witty and fun-loving Sung Dong-il, though, has a hard time talking to and relating with his eldest, 6-year-old Sung Joon. Because he had his kids (3) a bit late, Sung Dong-il doesn’t seem to know exactly what to do with these little energizer bunnies. He explained that his own parents divorced when he was young, so he grew up without a father, and thus he doesn’t know how to be a father to his own children. This was made quite apparent in the first vacation, where we saw that Sung Dong-il was a strict father figure, and Joon was a bit scared of his dad – their relationship was closer to what you would have seen in Korean society about 30-40 years ago. The show, which aims to help dads and their children grow closer together, really worked its magic on this father-son pair. By the second vacation trip, you could see a marked difference in their relationship: Sung Dong-il learned how to express his love to Joon, and Joon was much more comfortable talking to his dad and saying he loved him. During the first vacation, Sung Dong-il turned off his alarm in the morning, and thus fed Joon the leftover potatoes (from the day before), wrapped in toasted seaweed (김), for breakfast. It was hilarious, but reflective of Sung’s inexperience in the parenting department. On their second trip, however, Sung was the first one to wake up and get breakfast items for his son. It was pretty funny that despite waking the earliest, Sung didn’t bring back very much to eat, but the change was pretty darned apparent – and notably large. The second pair is Kim Sung-joo (40 yo) and his eldest, son Kim Min-gook, who at 8 years old is the oldest among the children. Min-gook is a bit of a cry baby, but he’s also very sweet and loyal. On both trips, Min-gook got stuck with the worst sleeping arrangements, and he cried quite a bit despite being the oldest. 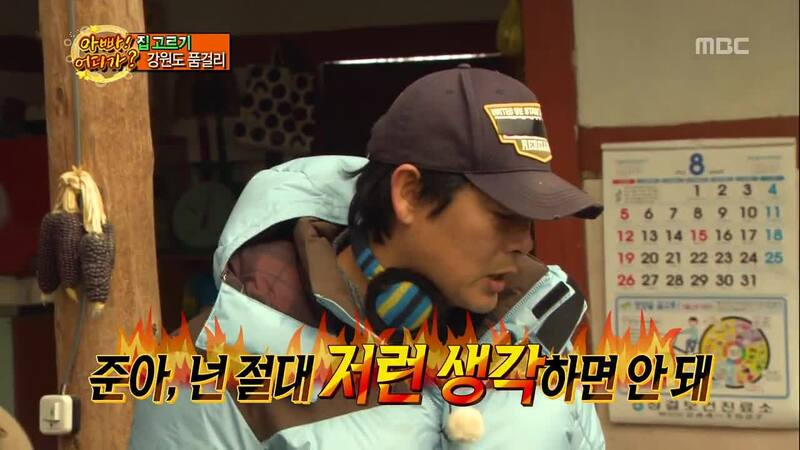 Kim Sung-joo admitted that Min-gook usually gets what he wants if he cries long enough. One funny note here: On the first trip, Min-gook was initially pleased when he picked House #1 out of the hat – because House #2 was the worst – but he soon remembered #1 wasn’t all that nice. Sung Dong-il offered Min-gook the chance to switch numbers with his family, swearing that he didn’t look at the one his own son picked. Min-gook agreed, knowing that there was the chance of getting #2 but willing to take that risk. He switched with Sung Dong-il and opened the paper to find… House #2. LOLOL. The adults cracked up while Min-gook bawled his eyes out, and we later found out Sung Dong-il did in fact look at his paper before offering to switch. Hahahaa. But back to little Min-gook. Though he cries quite a bit (he cried again on the 2nd trip when he got stuck with the tent instead of an actual home), he is also quite mature and loyal. On the 2nd trip, the kids were put on a “Hidden Camera,” and Min-gook was the only one who didn’t break his promise not to tattle, though he would have avoided getting in trouble if he had. He also raced out to see his dad first thing in the morning on the 2nd trip, because his dad had slept in the tent outside (while Min-gook was allowed to sleep inside with another family). We’ll see how Min-gook continues to grow and mature throughout the course of this show. Now on to our next family: actor Lee Jong-hyuk (38 yo) and his younger son, Lee Joon-soo (5 yo). Lee Jong-hyuk has played mostly serious characters until very recently, and most notably in A Gentleman’s Dignity. Turns out he’s pretty close to that light-hearted, slightly wacky character from Gentleman’s, not the broody characters from Chuno or Formidable Rivals. He was pretty funny on recently ended talk-show Win Win, but here on Daddy, we see he really is as immature and childlike as a kid. Seriously, the running caption for this father-son duo is “Who’s the dad and who’s the child?” Joon-soo takes after his dad quite a bit in the bright and happy department. On the 1st trip, when the kids were asked to memorize a children’s song about famous Korean historical figures, Joon-soo only tried a couple times before happily giving up and flashing his adorably maginormous smile. During the Hidden Camera on the 2nd trip, when Lee Jong-hyuk asked his son whether he had lied, Joon-soo giggled and nodded yes. Hahahahaa. He’s really quite adorable. The flower of the group is Song Ji-ah, the 5-year-old daughter of former soccer player Song Jong-kook (33 yo). For those who know their Korean soccer, Song was part of the magical 2002 team that made it to the semi-finals of the World Cup (for the first time in Korean soccer history). He was recently on Dancing with the Stars Season 2, and here on Daddy we see a completely smitten, prime example of “Daughter Dummy.” The term has become popularized the last few years, and it is used to describe a guy who is just plain ol’ head over heels in love with, and dotes on, his daughter – or, as is oftentimes the case, younger child actresses or ‘celebrities’ who would be the age of their daughter if they had one. Won Bin, for example, is well known as a “Daughter Dummy,” as is Park Yoochun. You can think of it as a Daddy’s Girl, in reverse. Little Ji-ah is one who definitely knows how to attract love and doting. Song Jong-kook lives to get a thumbs-up or “Daddy, you’re the best” from Ji-ah. On the 2nd trip, she instantly bonded with the grandmother who owned the house she and her dad were staying at, and she would announce “Grandma, Ji-ah is home~” whenever she came back to the house. I’m telling you, girls know what they’re doin’. 😉 All of this aegyo, apparently, is too much to handle for little Yoon Hoo (the last of our kiddies), because he is smitten with Ji-ah. 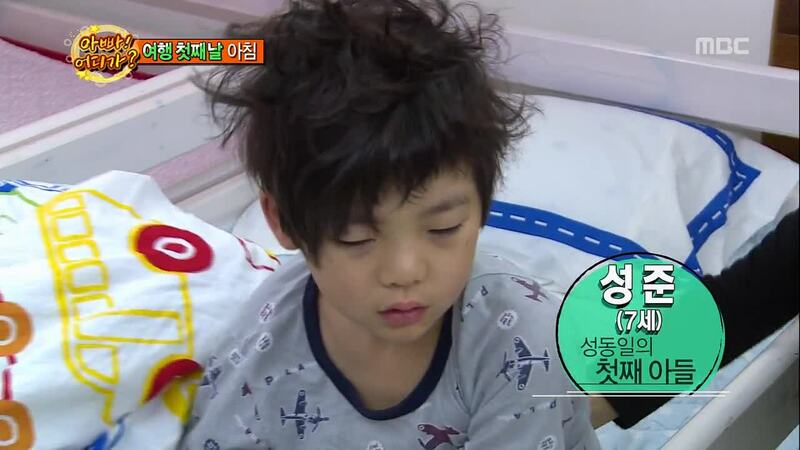 Oh little Yoon Hoo. Heeeee! Gaah, I can’t get a sentence out without squeeing over this ADORABLE little one who is hands down my favorite, and quickly becoming the mascot for Daddy among the Korean public. Stop copying me, people! 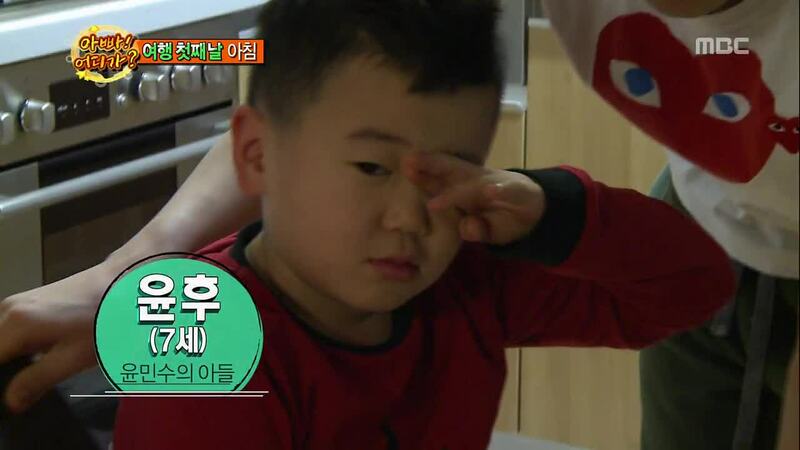 Yoon Hoo (6 yo) is the only son of singer Yoon Min-soo (32 yo). For those who know their Kpop, you’ll recognize Yoon Min-soo as a member of famous duo Vibe. For those who need a little help, Yoon recently ‘graduated with honors’ from Season 1 of MBC’s I Am a Singer, the show that gave new life to Kim Bum-soo and Lena Park (Park Jung-hyun). But I digress. Yoon Min-soo is the youngest dad of the bunch, but I would even go so far as to say he’s one of the best – if not the best – dads on the show. Now I’m sure all of the dads love their kids very much, but in terms of childcare, cooking, or playing with his kid, Yoon seems to be the most adept. I liked Vibe well enough, and I was pretty ambivalent about Yoon Min-soo on I Am a Singer, but watching Daddy really made me see him in a completely new light. He and Hoo get along so well, and it’s adorable how Yoon Min-soo likes to tease and play around with his son. There’s a saying that raising children never goes the way you want it to. But at this age, children are usually pretty reflective of the environment in which they were raised. Watching Hoo, it is quite apparent that he was showered with a lot of attention and love. Hoo looooves to eat, and it’s absolutely adorable how he can’t concentrate on anything else if food is anywhere in the vicinity. During the Hidden Camera, when other kids were running around scared at the turn of events, Hoo nonchalantly walked over to a chip, which had been dropped on the floor, and snuck it in his mouth while no one was looking. Hahahhaaa. As mentioned above, Little Hoo is in love with Ji-ah, and it’s ADORABLE how he follows her around while protesting to a teasing Yoon Min-soo that he’s just looking after Ji-ah because she’s a dongsaeng. Heee! Seriously, I can’t think of any word besides “adorable” for this little boy, and this show in general. One of the moments early on that really made me love Hoo was when Min-gook started crying during the 1st trip (after switching numbers with Sung Dong-il and getting House #2). Hoo tried to comfort Min-gook, but Min-gook kept on crying and crying, so Hoo walked back to the adults and told them he would take House #2 instead. Gaaaah. Yoon Min-soo hilariously grabbed Hoo and ran off before the trade could be made official, and Sung Dong-il (the perpetrator of the whole incident) told his son, “Joon, don’t ever say anything like that. That is neither loyalty nor anything.” LOLOLOL. I can go on and on and on about this show, which has taken over my Sunday evenings. Even my unending devotion to, and maginormous love for, Shinhwa has been bumped – I watch Shinhwa Broadcast aaafter Daddy. Though the children are squee-worthy, and the shenanigans hilarious, what truly makes Daddy a winner is the innocent and pure love it brings into our homes each week. Simply: Daddy, Where Are We Going? is the real deal. 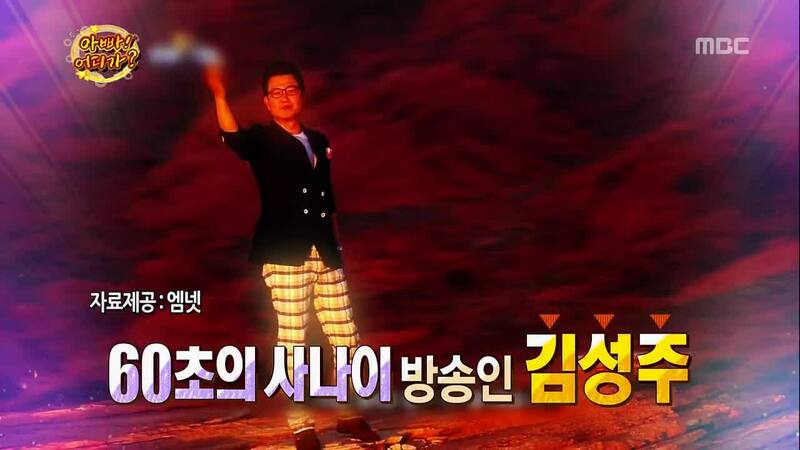 Oohh i love variety show involving kids.. May i know which broadcast station/cable channel is airing this? Oooh ignore me.. I think I missed out your ‘MBC’ statement in the first paragraph.. Mianhae.. This is so adorable, and I really love how your blog introduces me to shows I would typically never have watched — and all good stuff! I think the bond between a father and his children is so precious, and I’m glad that the show is raising awareness about the father-child relationship. Hope it encourages more daddies to relate with their children, especially the typically reticent Asian dad! 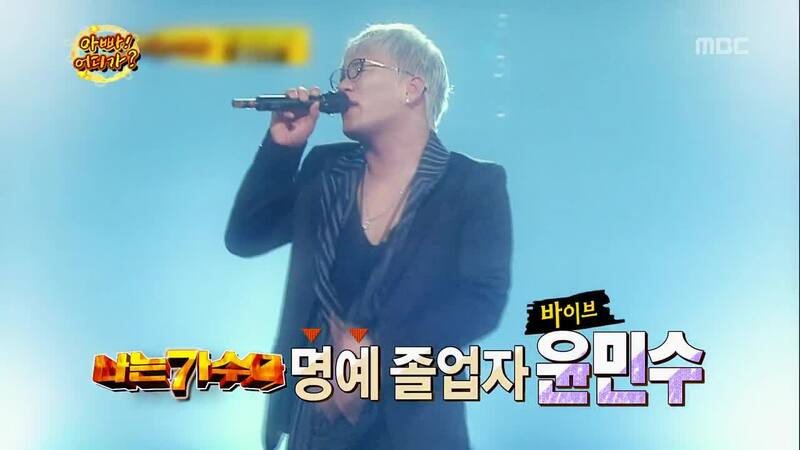 I’m so going to watch this along with Seo-young, Mr Kim, Shinhwa…. Phew!! I have to agree as a solo father with three girls, which thankfully they have grown up as ninteen olds!! Raising children you never know whats going to happen, or how things may turn out. Hope this gets onto the site that I watch Kdrama on soon! Thanks. Is there anywhere we can access this with Eng Subs? I’ve looked online and can’t find it anywhere. I would love to watch this. I guess that as it has just started, we’ll have to wait a bit longer unless someone can upload/sub it through the usual sites!! Hoo is also my favorite, haha.. He got me since he dug instant jajjangmyun out of nowhere, and as fast as lightning return it back when the house owner came (just to then shyly asking for it). I also would like to see how all the other kids progress as they’ve come to be more comfortable with cameras around..
you hit the nail right on the head! i just wish it were easier for fans in the US to watch this show! im thinking about moving to Korea just to watch all the variety shows 😛 no but seriously not only that I think Korea is a great place! glad i found your blog! ❤ it rocks! Join in the madness that is Korean love feast!! *corny*, I’ve been watching for the last two years from my end of the planet; New Zealand. and fell in love with ALL that is Korea from watching on my local T.V. But that pales in what is out there on the web, now my addiction is fed with the countless sites that cater for us non-Koreans… I can die a happy monkey!! FIGHTING! !